Soda Springs ski resort is a favorite for families and beginner and intermediate skiers and snowboarders. It’s base elevation is 6,700 feet, and rises to a summit elevation of 7,352 feet. Visitors can confidently explore the resort’s 200 acres of patrolled terrain from two ski lifts and two surface tows. This affordable resort will give you great value for your money, plus memories that will last a lifetime. Laying claim to the title of best snow park for kids in the Lake Tahoe region, Soda Springs caters to children of all ages with its Tube Town and Planet Kids features. Tube Town has a moving carpet and three twisty-turny tube lanes. Take a sleigh ride to Planet Kids, the place where the smallest skiers, aged eight and under, can get comfortable on the snow. It has ski and snowboard lessons, tube carousels, moving carpets, mini tubing and a volcano that can be climbed and played on. There is also a mini snowmobiling course with pint-sized snowmobiles for kids ages 6 to 12. The best part is that all the gear is provided: rental skis and snowboards, boots, and helmets. The kid-friendly coaches will teach kids how to stop, turn, and be safe on the slopes. Soda Springs has many trails to explore for the older members of the family, too. 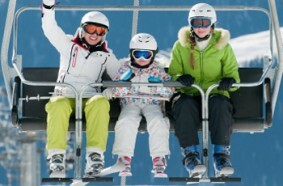 Its rental shop will outfit the whole family with state-of-the-art ski and snowboard rentals. Soda Springs is located 10 miles west of Truckee, CA, and 45 miles west of Reno, NV, on Interstate 80, making it the closest family-focused resort to Sacramento. Avoid the crowds and be prepared for an amazing family vacation at Soda Springs. Do some exploring and visit several other great Lake Tahoe ski resorts while at Lake Tahoe. Our Lake Tahoe ski resorts map will familiarize you with all the resorts and their locations. Season: Mid-November through mid-April, weather and conditions permitting.